One of the delights of Winter in many urban gardens in Tasmania, is the arrival of honeyeaters to feed on the array of "exotic" native plants that flower at this time of year. As I sit typing this story, I can hear the unmistakable "jik" call of a Crescent Honeyeater, just outside the window. It's there to feed on the red flowers of a callistemon (bottlebrush), now unfortunately showing its' 40 years plus, and beginning to slowly die. Every no w and then, I try my hand at photographing them. I say them, but in truth, I've no idea how many visit, rarely seeing more than one at any one time. They do seem to have a routine, arriving via a closeby dense shrub, and warily watching for some time before showing themselves. The male Crescent Honeyeaters then usually announce themselves by singing, before partaking of the pollen. The females, with their relatively subdued plumage, slink in, trying to stay as unobtrusive as possible, largely because if a male Crescent sees them, they'll be chased off. 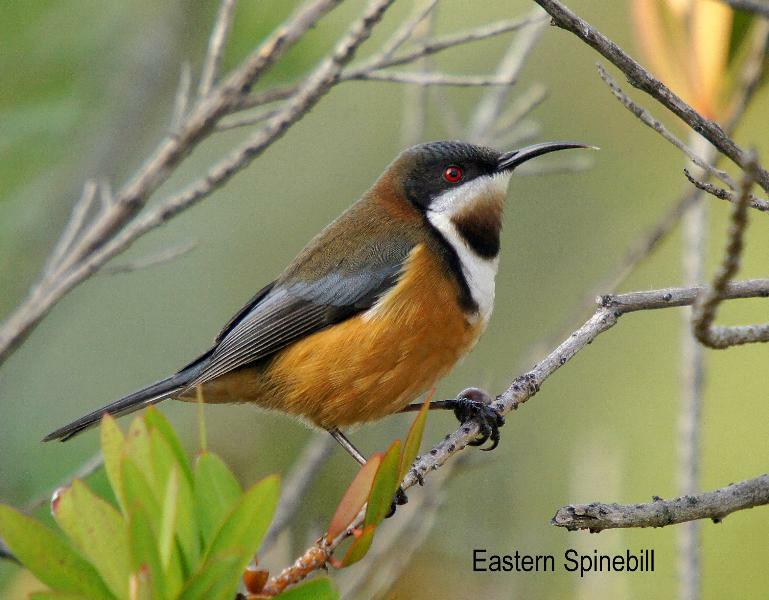 Another unobtrusive visitor, far fewer in number, are the Eastern Spinebills. In fact, it was only while trying to photograph the Crescents that I realised that they are regulars too. Difficult to photograph at the best of times, with their hyped up behaviour with constant flicking of wings and tail, the image at top is the only worthwhile shot I managed in several attempts. Every once in awhile, a flock of Silvereyes will descend on the garden, their arrival preceded by the constant "tang tang" call that keeps the flock together. I counted at least 30 birds in one arriving flock, feeding on both blossom and insects, mainly whitefly and greenfly. Welcome visitors to me maybe, but their arrival, if spotted, is anathema to the resident Little Wattlebirds. With much snapping of bills, they plough into the shrubs holding the visitors, and chasing them with considerable vigour, when they take flight. Since I started this story a month has passed and I realised if I didn't publish it soon, Spring will have sprung, and I think maybe it already has. On a recent visit to Risdon Brook Park, I heard then saw 2, almost certainly a pair, Fan-tailed Cuckoos, seemingly on the prowl, and at Peter Murrell Reserve, I heard a Horsfield's Bronze-cuckoo calling. With the continuing dry weather here in the south-east of Tasmania, together with sunny days, one might be forgiven for believing that Spring has indeed arrived. But I don't think we've quite down with Winter yet! I can't recall seeing shining bronze-cuckoos during this or any other Winter, but I have seen several Horsfield's over the years. They usually hang out in extensive areas of acacia. But both bronze-cuckoos are difficult to find unless they're calling. Fan-tailed Cuckoos now regularly overwinter, and in recent years I've seen and heard many around the south-east of Tasmania. In fact, last Winter, I saw more during the Winter than I did all Summer! I'm so excited to see your photo of the Eastern Spinebill. I've spotted this little fella every year on my tree in front of our lounge window but have never been able to photograph him properly to identify him. I wasn't sure if he was a Spinebill but now I know for certain that it is!